Here's an option to introduce your kids to the piano. Children as young as three years old will enjoy following the lighted keys as they play familiar Primary songs. This is a fun addition to your homeschool and Family Night activities. All my kids have learned to play the piano, and I've found that they do their best when it is still fun. That first introduction to the piano is the most important. 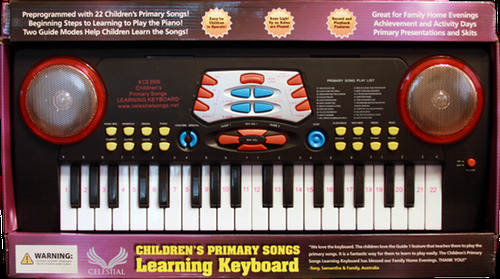 This keyboard may be the answer -- it's programed with 22 Primary songs. Take a look at the video and see what you think. The price is reasonable and I've been informed that over Thanksgiving weekend, on Black Friday (the day after Thanksgiving) they are offering 40 percent off on all their products. Let me know what you think -- I'd love to try it out with my three year-old granddaughter. And my Primary class.